NAVIGATE THROUGH THE MARIACHI WORLD, YOU WILL NOT REGRET. 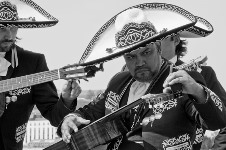 The mariachi music has been declared by UNESCO in November 2011, an intangible cultural heritage of humanity. The mariachi music is one of the most representative element of the mexican culture. Since its origin in the state of Jalisco, Mexico, it has been a way to express happiness, sadness, joy or angry. The mariachi performance is very known for the serenades and birthdays, in the famous mexican "plaza garibaldi" , mariachi bands are waiting to be called by the customers to perform in any type of events. Our band is reachable for you in this European region.